Today we get vulnerable about managing our disappointment and redefining success, but don’t worry, we give you some good news, celebrate a success with #Morganization, and throw some sharks into the mix! And we even have a listener’s trampoline story to share! I’m Morgan Hansow and this is my husband, Dave - we’ve spent the last 20 years on a wild adventure that’s taken us to Africa, the Oprah show, and Hollywood. Welcome to Chasing Unicorns… a podcast about giving ourselves permission to chase our dreams, explore our faith, and figure out who we are, all while trying to keep our crap together! As Creatives, Humanitarians, and Parents, we’re learning (sometimes the hard way) that the hustle and pursuit of the elusive unicorn will never satisfy. Each week we explore what it looks like to live authentic, passionate, and connected lives while being a part of a movement that’s trying to transform the world through story + grace. Welcome to Chasing Unicorns! Today we’re gonna get vulnerable about managing our disappointment and redefining success, but don’t worry, we’re gonna give you some good news, celebrate a success with #Morganization, and throw some sharks into the mix! And we even have a listener’s trampoline story we’ll share! Yay! Episode 8...2 months Baby!!! It’s been so fun and I really do look forward to recording the episode each week. My good news this week is about a kid named Richard Jenkins from inner-city Philadelphia. As a kid, he was constantly bullied for always raising his hand in class—so much so, that other kids began mocking him by calling him “Harvard” to make him feel bad for trying so hard in school. When he was in 6th grade his family lost their home, and so He and his two brothers spent the next two years moving in and out of homeless shelters and hotels. So during this time he began to realize that a really good education was his means of escape. So he began earning good grades. Unfortunately during this same time, his dad had a heart attack and passed away. As high school began to come to a close, he decided to apply to Ivy League Schools, even though no one around him had every accomplished anything like that. His biggest dream was to go to Harvard. Well… this year he was accepted to Harvard with a full ride scholarship….. So this kid goes from being homeless, losing his father and getting made fun of by other kids calling him Harvard… to being accepted into one the best schools in the world by that same name. Beautiful! You Guys! This story literally made joyful tears come out of my eyes!!! Last week in Georgia an 8-year-old boy named Maurice saw an elderly woman struggling to go up some concrete steps with a walker by a park so he asked his mother to pull over so he could help her...He had no idea that someone in the car behind him filmed him and posted the video of this random act of kindness. The video went viral and it shows Maurice helping her up the steps and she turns and give him a hug and then he bounced back down the stairs and hops in the car! It turns out the person who captured the video was also moved to tears as he watched the encounter which is why he filmed it! You gotta check out the footage if you haven’t seen it already, it’s only 40 seconds long and it will give your heart an infusion of joy and hope in humanity and the next generation of world-changers! Dave and I have always said vulnerability is our secret weapon and so today we’re going to invite you into the conversation that we’ve been visiting and revisiting over this last week, which revolves around managing our disappointment. Yeah, it’s honestly been an ongoing struggle for me the last month and so we’ve had lots of talk about this topic and thought we’d bring you in on it. This last week I realized that our success with taking risks, pursuing our dreams, and seeing things ‘work’ at a young age really wrecked us. I mean by 26/27 we were living our dream and running an organization that by year 3 was operating at a half-a-million-dollar budget. We had been invited to the Oprah show and were in the process of making a feature-length documentary. As life happened and circumstances changed and we were approached to hand over our Ugandan operations to another fair-trade company, we started shifting our attention to storytelling through film and we had high-hopes of our new project and our new dream, the ‘The FIND’ - essentially a travel show with a social bent. For 3 years we gave ‘The FIND’ everything we had as an organization and a family - we partnered with our amazing donors who generously funded 3 seasons of the show and we had the immense privilege of telling the incredible stories of world-changing people and projects. But our high-hopes of gaining traffic in the busy and fast-paced entertainment world have left us disappointed. And then it really comes down to how we’re looking at what we’ve done and how we’re measuring success. Yes, we are playing on networks in 5 countries, but if we look at numbers of views here in our home country, it feels dismal. You know, it’s so easy to reduce something to ‘likes/views’ and put weight on that for worth, which ultimately we know is SO worthless! But it’s not only that, but it’s also that there are these words and dreams/visions we’ve had for the project and the stories that we’ve been carrying around for 4 ½ years that don’t feel like they’ve come to fruition yet! True, and as crazy as it’s going to sound, there are only a couple of times where I’ve felt like I’ve ‘heard’ God’s voice and one of them was a word/promise I felt like He gave me in December of 2013. I have it posted next to my computer and so I see it daily and I look at it and think, ‘Wow, I know you are faithful and I trust you God, but that seems like such an impossibility based on where we’re at now!’ And like we’ve mentioned in previous podcasts, we’ve had a couple opportunities in the past year - talks with Producers in LA that were leading to us being Creative Directors over a new media network aimed at millenials and then most recently, talks with someone who wanted to come alongside us to help us get our show picked up by a network or a online Streaming service like Netflix. We definitely hit a dead-end with the LA Producers last August after 5 months of talks and negotiations but this other most recent opportunity has also seemed to fizzle and we’re left with the disappointment and the reality that even if we wanted to go back and start back up with more seasons of ‘The FIND,’ we’ve lost some momentum because we’ve pursued some other opportunities in the last year. Not to mention, that for the past 2 years I’ve been relying on my design work as the sole way of providing for our family, so in doing the practical thing I also feel like I am giving up on my dreams and my passions. If I’m honest, it’s been a real inner struggle! Yeah, it’s so easy to sugarcoat the past and miss out on the now. Or even miss the now because we’re so consumed with the future that we don’t realize that what we’re living now will be the ‘good old days’ of the future. But it’s also important not to minimize the feelings because in these legit moments of grief, disappointment, and frustration with where WE’RE NOT professionally, there are absolutely truths to where we ARE now and it takes purposefully and intentionally calling those out and being thankful… thankful for the divine and unimaginable opportunities that our kids are getting to step into their destinities with the arts at a young age - with dancing, acting, singing, and modeling. Thankful for flexibility with our schedules to be present and available for all our kids’ activities. I’ve chaperoned more field trips and 3-4 day camps for our kids in the last 2 years than I have in all their previous years of schooling combined. And then there’s school - which is a challenge for Jadyn and she needs extra help with all her homework and so we’ve been able to help walk her through all her homework each night and create flashcards for studying spelling and preparing for tests. If I think back to the pace we were going at ten years ago, there’s no way we could have been this invested and present with our kids. True, and so even though we still have big professional dreams that we’re not giving up on forever, we’re having to shift our perspective in this season and redefine success. Remember on a way to a birthday party a couple weeks ago Babe? Remember when I turned to you and said, “Do you think everything we’re working on and have worked on is amounting to something?” And your reply was, “I don’t know, I hope so, but I think our kids are going to be our greatest project, I hope they do way more awesome things than we could ever dream.” It was absolutely truth but it felt like a big conviction check in my spirit. I hope I get opportunities to do the things I’m dreaming of, but I remember I instantly thought about a conversation we’d had in LA several years ago when we attended a story workshop with one of LA’s top producers—a man who’s worked on massive projects—tell us about how he missed out on a ton of his kids’ growing up b/c he was gone on these huge productions. His kids are grown and I think he has grandchildren now, but there was definitely regret in his voice. And I just think, how can I shift my perspective to seeing my kids as my biggest legacy - allowing them to stand on our shoulders and the foundations we’ve laid to go far beyond what we imagined. And how can I find balance in still pursuing our passions and our dreams while not getting lost in them or finding our identity in them? Because we’ve always said we want to model for our kids what it looks like to be a dreamer and a doer and risk-taker. Well I think for us we have to see the limited window we have - when I start to get anxious, like I have several times in the last couple months, about where I’m at (or not at) in life compared to where I imagined or I start to measure success from earthly measures or compare myself to others, I can easily bring myself back to the reality that we only have 5 more years with Asher in our home and 7 more with Jadyn...that thought alone starts to bring tears to my eyes. It’ll be here before we know it and the truth is that when our kids are out of our home, you and I will be 43/42 - we’ll still have lots of time to pursue our dreams and passions (and remember you told us that the most successful ventures are actually started by people in their middle age, so that’s hopeful)! That is true!!! Yeah, I don’t know if these thoughts resonate with any of you, but that’s just the honesty about the conversation that’s swirling in our home and what’s taking up our nightly pillowtalk. Well, you get it, I’m just saying it’s so easy to focus on the lack or the ‘not’ instead of having eyes to shift our perspective and heart posture to what we are and what we do have! There have been some victories in the Hansow home folks! 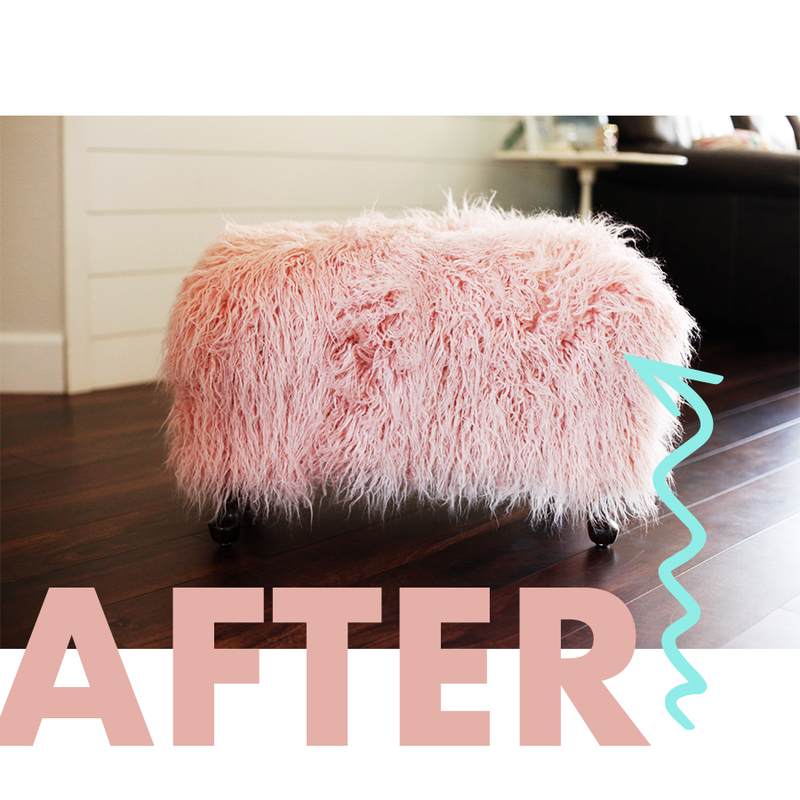 Back in Episode 2 when we introduced the ‘Morganization’ section I shared about the ottoman I bought at a local antique store this past December with the lofty ambitions of reupholstering it… I took off the fabric, sanded down and restained the feet and then got stuck when the staple gun wouldn’t go through my new fluffy pink fabric so I let it sit in the corner of our bedroom for 5 months like a hot mess. It then sat in the trunk of my car for another month as I tried to connect with Joe ‘they mystery’ Upholstery man and then with my mom’s 3-week visit from Colorado, she took over for the win… she not only helped me finish it but upgraded it as well - she replaced the foam to make it extra comfy and she even sewed me matching fluffy pillows! Aside from hitting my finger with a hammer, it was fun mother/daughter project and I LOVE the way it’s turned out! It makes me Happy! I’m happy it’s done as well and we finally got the sewing machine and all the tools put away. And for the couple weeks that Morgan and her mom were working on it the fluffy fibers were floating all over the house - it was kind of like we had a long-haired cat. It was on the floor, our clothes, and floating around in the air - I even had a few instances where I found myself with the hair in my mouth! And Morg, you kind of glossed over the hammer incident but that was a big deal, you smashed your finger, there was a lot of blood and pain and that’s when you called in my hammering skills as a back up! Yeah, hitting your finger with a hammer is no joke- it hurts SOOOOO bad! It was the outer edge of my index finger and it kind of separated my nail from my skin - it throbbed for hours, bleed a lot, I got a purple spot in my nail - I soaked it in ice water, used some super glue and the good news is my nail did not fall off! I’m so happy to be finally have that looming project completed - it’s a fun, quirky piece that brings joy and comfort to our sitting nook. It does look amazing - you did a great job and thank you Joanna for your great skills! Also, I want to mention that the kitchen appliances in our garage are FINALLY on craigslist so I’m loving that we’re getting stuff done! So have you thought through your next project? Yes! When we moved into the house a year ago we bought a cabinet painting kit from Home Depot for the cabinets in the laundry room. We picked a grey paint that they mixed for us and then the kit has sat in our garage for the last year! Yeah, I have moved it around like 15 times as I’ve installed shelves or tried to organize. I know, I think I moved it at least 3 times this last week getting in/out the bin of summer clothes for the kids! Well I’m going to commit to taking the paint into Home Depot to be shook and then getting the project done! But since we’ll be heading to Colorado for a wedding and to see family, I’m gonna give myself a deadline of the the end of June! Nice! Well I too am excited for this! We’ll check back in in a few weeks! We did hear from a good friend and listener - Miya in Florida who told us that she’s been using sticky notes around her house with the word ‘Morganization’ on it to help motivate her with all the projects she is wanting to finish! Ha - love that! Go for it Miya - one project or pile at a time! No shame! segment where we reflect, reminisce and remember the most ‘Holy’ moment of our last week. DAVE - My holy moment came in the form of putting some music on and getting to work on some design work for myself that I’ve been wanting to do for a while now. I mean… it funny because I’m a designer… I work with typography, logo design, branding, and even film… but it’s all for other people’s visions. For their companies, and brands. So yesterday I made time to work on about 20 social media posts that you should start seeing this week from our Hansow Family Instagram Profile. The thing is, I’ve always seen Social Media as a way to encourage, and inspire people to use their lives for more… So making time for creative things like this are a big deal to me. It’s just so funny and sad to me that it literally only took about 3 hours for me to feel full. To feel excited about my work. It’s literally something I had been hoping to work on for months, and it only took a few hours. So yeah… my holy moment came in the form of photoshop and music this week. Yesterday I took Jadyn to the dentist for her routine cleaning - it was the first time seeing a dentist here in Redding and even though we had seen our beloved Colorado dentist a year ago. She’s never had a cavity, but yesterday she was told she had a few small cavities! I was flabbergasted and she was devastated, especially since she eats pretty healthy and brushes twice a day. I have no idea why the onslaught in the past year, I know she doesn’t like to use a lot of toothpaste and she’s decreased her milk intake because she’s not too found of milk, so all I can assume is that it’s a combination of weakened enamel. But regardless, we talked about coming back to have the cavities taken care of at a future visit and after we left Jadyn was so bummed, especially because she is absolutely terrified of shots! We talked about plans to increase her brushing time, up her milk intake, add in a multivitamin, and start flossing daily. You know, all the practical stuff. (Morg, this isn’t sounding too holy…) Hold on! I’m about to get to it, but I have to give the backstory! So here’s where it gets holy… I had to run into the grocery store real quick to grab milk and she wanted to stay in the car. When I got back in the car, Jadyn spoke and said, “Mom, God does miracles all the time so I’m going to pray and ask others to pray for my cavities to be healed AND I’m going to work hard on taking better care of my teeth too.” I was taken aback, here I was only thinking of the practicals and she was thinking about her situation on a spiritual or supernatural level - of course she should be praying for God’s healing! And of course, God cares about our teeth and wants to heal all. I mean over and over the Bible says that Jesus went around healing ALL disease and infirmities and if He’s the same yesterday, today, and tomorrow, then healing should always be our prayer! In an instant, I was totally inspired by her faith. And we got back to school to pick up Asher, she took the initiative to go up to one of the middle school teachers to ask her to pray over her because she had a testimony of having years (like 30 years) of not going to the Dentist and receiving prayer and then going and having absolutely no cavities! True! For the last year we’ve been talking about doing this and we finally did it...we watched JAWS in our backyard while floating on floaties in our pool! And let me say that the water was not exactly warm - we’re starting to have 100º days already but since the temperature is still dropping at night, our pool temp is still on the rise. Which is why everybody but Morgan/Asher only lasted half-way through the movie. Well to be fair, after spending time in the water on a floating mermaid’s tail ring, Asher and I ended up on this giant floating clamshell which is really like a big raft and so we were able to stay out of the water and even keep on a fuzzy blanket for warmth! I can’t imagine what our neighbors thought hearing the classic JAWS music (or the gunshots) outside but it was most definitely a memorable night under the stars! And here’s the thing...we almost canceled it! We had gotten into the pool in the afternoon in the heat of the day and even then the water was chilly but the blazing heat from the sun made it refreshing. Morgan was convinced it would be too cold at night and I was thinking about the work it would it would take to get out the movie screen, the extension cords, the projector, and the figure out all the hookups (not to mention having to spray ourselves with bug spray). We had pretty much decided to call it off and ‘do it later’ in the summer until a few hours later when I had the realization that if we don’t commit and actually do the thing we’ve been talking about doing we won’t ever do it because we’ll always some excuse or reason why it won’t be convenient. So even though Morgan had already told friends we were on the fence and were most likely going to cancel, we said screw it - let’s do it no matter and so we texted everyone back and said it was on! Yeah, in our experience, we’ve found that most of the crazy ideas we have need immediate commitment and follow-through (and I’m not even saying that this is that crazy of an idea, but it was different enough to require some serious commitment and an ‘all-in’ mentality)! And to think, we would have missed out on some serious fun and memorable memories had we forgone it! So True - we have some photos on our Instagram from the night if you want to check them out - @HansowFamily! I just listened to Rise, and it was sooo good. Ironically we just bought our daughter a personal sized indoor trampoline. It’s hot pink and has this padded security bar that she can hold onto when she jumps. It cracks me up though cause we had a trampoline growing up and it didn’t have any protection. After the padding on the springs disintegrated from the sun, I remember jumping and old springs may or may not fly off at any moment...or the worst is when you would complete a flip and overextend the landing right between some springs. But the story I really wanted to tell was about when I was maybe 10?! It was just another day of my mom sending us outside to play all day (of course never supervised cause that wasn’t a thing back then) and I convinced my little brother that we could maximize our jumping experience if we combined it with swinging. So brilliantly, we pushed the trampoline under the swing set and I mounted the trampoline ready to give it a go. I held the swing against my body and gave a big jump lunging forward. Just when I reached the point where the swing was “logically” supposed to bring me back down, the C-shaped hinges (cause I guess circular hinges were also not a thing?!) came off the hook and I, along with the swing, went catapulting off the trampoline. Turns out my trampoline-swing idea landed me nothing but a broken arm. Are you struggling with managing disappointment? What have you found shifts your perspective or gives you hope? Do you have thoughts about the ’Good Old Days’ or creating a legacy? What crazy idea are you going to follow through on even if it’s a little impractical or inconvenient? If you enjoy this podcast we’d love to have your review and ratings, please take a couple minutes and give us a positive review in iTunes or wherever you listen to Podcasts - it really helps new listeners find us. And lastly, in itunes go ahead and click the subscribe button if you haven’t done so already so that each Thursday you can get an alert when the new podcast goes live. “Today’s show has been brought to you by the word ‘Shift.” We validate your current circumstance and any disappointments you may be facing AND we challenge you to shift your focus. May your eyes be opened to see the things that you do have and the things that are going right. May your heart leave comparison and counting likes/views and find its place settled in the security of contentment. May you give yourself permission to do things that build memories and cultivate joy in the here and now. And above all, may you shift your focus to see that you are living in ‘Good Old Days’ and with that shift may gratitude abound!